E3 2013 is over, leaving a dustcloud of next-gen gaming goodness in its wake. We've been hit with a tidal wave of new titles to get excited about, promising to make the next year a big one for every platform. But which titles were the ones to really catch TechRadar's eye this year? Here are 10 upcoming games from this year's E3 for Xbox One, PS4 and Wii U that we can't wait to arrive. Half-Life 3 might have been missing from this year's E3 (again) but there was another threequel that we were almost as happy to see. We really don't think many people saw Kingdom Hearts 3 coming. However, according to game director Tetsuya Nomura, the game was announced "too early" in its development so we'd advise a little patience. Still, we know it's on its way and that's good enough for now. This one will land on both Xbox One and PS4. Ubisoft dropped its own "one more thing" this year in the shape of The Division, an RPG shooter set in a post-apocalyptic New York. The game will throw players into a constantly-online multiplayer world, utilising Massive's new Snowdrop engine. Much like Ubi's other new games, The Division also has its own companion app that promises to be truly integral to the overall experience, not just a cack-handed gimmick. What's that? Did we call this one? Yeah, that's right, we did. We can't gloat too much - you only had to add up the numbers to see that EA green-lighting a Dice-made Star Wars: Battlefront made perfect sense - but we can say that we're expecting huge things from this one. We might miss Lucasarts already, but we can't wait to see how far awesome Dice can make the Star Wars Universe look on the next generation of consoles. Remember the video for Californication by the Red Hot Chilli Peppers? Well the trailer for Insomniac's open-world shooter, Sunset Overdrive, reminded us a little bit of that. Except a thousand times better. In other words, it looks like one big dollop of fast-paced fun and we can't wait to get our hands on when it arrives on the Xbox One. Details are a bit thin on the ground, but we know that the game revolves around a mutant takeover - and it's your job to take on the plague. Ready At Dawn's steampunk actioner certainly piqued our interest when its mysterious teaser trailer dropped during the Sony conference. We're yet to see any in-game footage, but The Order: 1886 is a PS4 exclusive that's been stuck in years of development due to the limitations of the current generation. Now it's here, expect it to bring out the big guns. Zombie games are all the rage (pun very much intended), but the Dead Rising titles have managed to stand out from the horde due to their "use anything you can find" system of fighting off the infected. It looks as though we'll have even more tools at our disposal in the third chapter. We're also told that the game can handle three times as many zombies as Dead Rising 2, and will offer the ability to get the undead's attention by yelling at them via Kinect's voice functionality. The first thing to say about the new Metal Gear Solid is that it's launching on both Xbox One and PS4 from the get-go. That's kind of a big deal considering that Snake's legacy has resided mostly on Sony's consoles. As for how the game actually looks - yes, a lot of you were quick to point out that it looks very Red Dead Redemption. But hey, that's no bad thing, right? 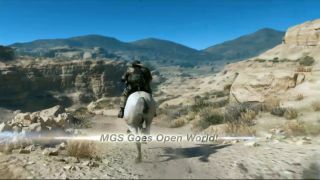 An open world Metal Gear Solid? Yeah, we'll take it. Mario Kart always promises to bring the fun and frustration in equal measure, but if you thought things had been getting stale, take a look at what's coming in the eighth circuit. Anti-gravity racing? Check. Underwater racing? Check. Mid-air banana throwing? Check, check and check. We're so ready for this. This is it. The big one that just about everyone tuning into the Nintendo Direct case was waiting for - and the Mario crew didn't disappoint. We don't know the full extent of new characters Nintendo is adding to the new Super Smash Bros. roster, but a few names have already been announced. Our favourite so far is the Trainer from Wii Fit - solid proof that Nintendo still has a quality sense of humour. Even better, it's coming to 3DS too for cross-platform play, and letting you take the fight on the move. Right now we'd describe Ubisoft's second title on our list as a sort of Grand Theft Auto, but without the ability to actually get out of the car. Like The Division, the solo experience is on offer but, as the name suggests, this is more about teaming up with other players to complete vehicle-based missions around the massive open world environment - the entirety of the United States, apparently. It'll land early 2014.